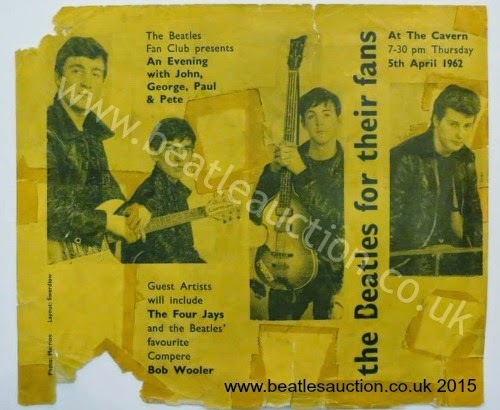 On Thursday 5th April 1962 the Cavern Club played host to a Beatles Fan Club event, held for members before the boys headed off for another stint in Hamburg. They started the show in their leathers and then changed into their suits. This yellow coloured handbill for the show was the first to feature images of the group. Like most handbills and paper memorabilia, quite a lot were disposed of after the event which makes any that do turn up quite rare!